Can you arrange four 5s so they equal 6? Scrabble gets a heavy workout on all of my devices. I play it every day, usually in multiplayer games via app and Facebook. Having it on my Kindle seemed like a natural fit. Although I have a huge book collection (about 6,000 volumes), I still love my Kindle for its portability. I’ve had a 2nd generation model for over a year, and I just got hold of a 3rd generation model. The new screen is fantabulous, with superb contrast and clarity. The web browser is vastly improved, the storage capacity is higher, and the WiFi option is welcome. The new design is more compact and sleek, with a redesigned book cover that features a built in light. Overall, it’s a good improvement on the last model, although it still lacks a touchscreen. Until that’s resolved, gaming on the Kindle is going to be difficult. I’ve already written about the two free games, both of which have their merits. Now we come to the Big Daddy of word games. Scrabble for Kindle is a half of a good game. Given the interface limitations, the controls are fairly effective. You use the directional controls to choose your space, and then just type in your word. All the rest works just as you’d expect, with a full Scrabble dictionary, scoring, and a few setup options. Unfortunately, not all the setup options are winners. For starters, games versus AI opponents are limited to you and one computer-controlled player. Although pass and play can accommodate up to 4 players, solo play can only handle two. Not good enough. “Game Style” settings allow you to select various point or round limitations for shorter games, but there is no option for choosing alternate dictionaries. The biggest failing, however, is the lack of multiplayer mode. 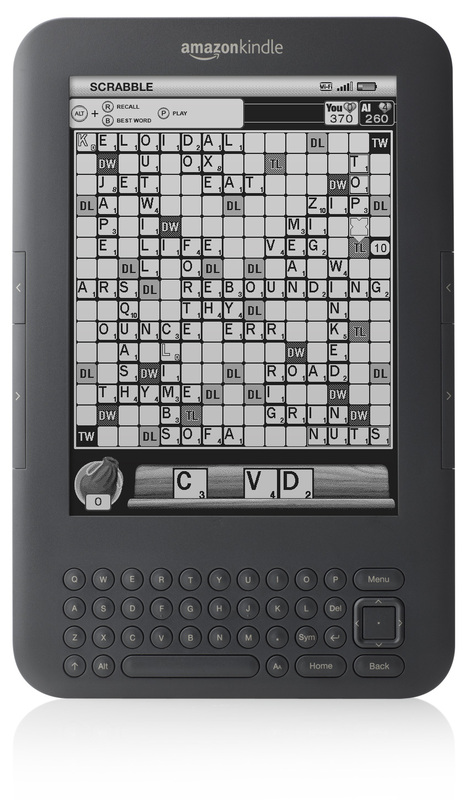 Scrabble is not a hard game to adapt for turn-based multiplayer, and, depending on the model, the Kindle has at least a WiFi connection and perhaps 3G. Why not enable the Facebook/PC/app-linked multiplayer support? Because people might use their free 3G time playing Scrabble online? If that’s the reason, it’s a pretty poor one. 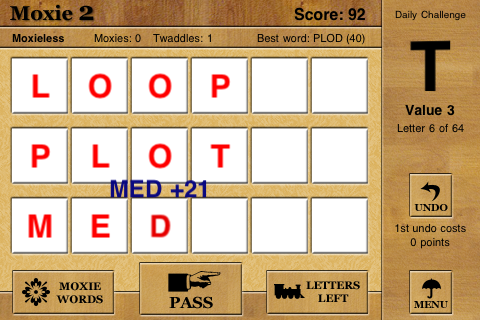 Moxie is a word game in the UpWords/Scrabble/Boggle family, but with a fresh feel that’s often lacking in the genre. The goal is word building. The original Moxie has three rows with five spaces each, while Moxie 2 increases that to six spaces each. The game creates a list of 64 tiles distributed in random order. You get one letter at a time, which you can place in any space on the board. As you fill in these spaces, you’ll begin to create words from three to six letters long. Once you create a word, you get points depending upon its length and the point value of its letters. Words remain on the board after being formed and scored. By adding letters and placing new letters on top of old, you create new words. For instance, you place SAT and score the points. Your next letter is an I, so you create SIT, which also scores. Depending upon your letters, you can then form SITE, SITED, CITED, and so on, scoring for each. Thus, if you think you have a chance for a higher score, you can break a chain in order to play for a longer or better word. Using the previous example, you can changed CITED to CITID. This breaks the chain and incurs a one-time penalty. You follow up with CITIE (no points added or subtracted), and then finally the scoring word, CITIES. Moxie 2 has a helpful screen that tracks the letter distribution during the game. This means you’ll always know how many “E”s are left, but you won’t know when you’ll pull them. The dictionary appears to be based on standard Scrabble Tournament lists. Bonus points are awarded for forming any of the “Moxie words,” which are found on a list. Each of these is worth anywhere from 100 to 500 bonus points depending upon length. They’re grouped in three categories—animal, vegetable, and mineral—and contain words such as ZIPPER and WOMBAT. There’s also a fresh Daily Challenge every day. These place three words on the board at the beginning of the game, and you need to build new words from these. Letter replacement games are hardly new, but Moxie does it very well. This is remarkably addictive little game, and probably the best single-player word game on my device. It has a very laid back feel, with muted colors, an appeal visual style, and no time limits. There is a very appealing strategic element in Moxie, as you decide whether to go from the quick score or take your time building towards larger words and bonus points. There’s no reason to take my word for it. Go try Moxie 2 out for yourself.